The overall project included a “Chamorro Cultural Center” opposite the entry to concourse area included a 4500 gallon salt water aquarium, a Chamorro Hut, Latte Stones and artist’s renditions of local historic landmarks. Upgrades to the existing concourse passenger terminal areas included TSA security areas, construction of new food court common and seating areas, renovation of 10 each new restrooms. 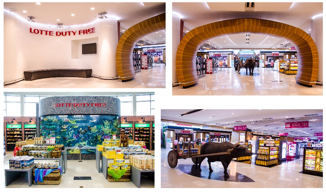 The project was performed over a nine month program to implement “Phased area completion” as part of a rapid transition from the previous retailer to opening Lotte retail sales areas. Black Construction Corporation was successful in meeting each phase requirement in order to stock and open all sales areas and begin earning revenue for the client. BCC was awarded the contract for this project on October 10, 2013 with a start date of November 01, 2013. Opening the perfume and cosmetics area as the first phase milestone was to be completed by December 30, 2013. This and subsequent short schedule milestones made up the many challenges Black Construction Corporation faced with regard to performing work within a fully secure/funtional international airport. Each and every person entering the project site would need to be screened, with complete backround check prior to gaining access to secured areas and begin working on the project. BCC employed over 150 staff and craft personnel which needed to pass through the security checks. Cooperation and coordination with Lotte, GIAA Police, TSA and Homeland Security was essential to expediting this process in order to furnish manpower to the site immediately to meet the impending first phase completion. Logistics presented challenges associated with both schedule and airport access. The short schedule durations required air freight of most finish materials not locally available from as far away as Italy for items such as tile. Materials were landed, cleared and received at BCC’s warehouse in preparation for coordination and delivery to the GIAA loading docks. Delivery and navigation to the concourse level required precise coordination with airport operations schedules for delivery and use of service elevators. Guam Interational Airport Authority passes approximately 1.7 million passengers through the terminal annually. Performing construction activities amongst the daily passenger traffic throughout the terminal required BCC to perform work where and when optimal production performance would be gained. Protection barriers were instrumental in isolating work areas for security and passenger safety. These constraints necessitated implimenting a two shift 24/7 day work week. In order to meet production requirements sequencing of activities was approached in an unorthodox manner of allowing trade work to take place at various hours of the day to gain access to the same work areas. BCC performed work on all minor and major holidays to keep schedule requirements.